Is there any benefit of adding Whole pelvic RT to Intermediate & high risk Ca prostate in comparison to Localized RT ? Current recommendation still favoring whole pelvic RT despite at least 2 prospective randomized trials showing no benefit in 5 year PFS ? Oncology Group 9413. J Clin Oncol. 2003 May 15;21(10):1904-11.
of local, regional, or distant disease; PSA failure; or death for any cause. 4-year PFS of 54% compared with 47% in patients treated with PO RT (P =.022). 50%, respectively; P =.008). No survival advantage has yet been seen. Therapy Oncology Group 9413 trial. Jr, Shipley WU. Int J Radiat Oncol Biol Phys. 2006 Nov 1;66(3):647-53.
cm) RT resulted in progression-free survival (PFS) comparable to that of WP RT. neoadjuvant and concurrent hormonal therapy (N&CHT) in Arms 1 and 2 of the study. larger field considered an "MP" field and the smaller a PO field. gastrointestinal RT complications correlated with increasing field size. Finally there was an update… but this is super complicated. You need the full text and you need to read the discussion carefully. It can be found on pubmedcentral. To summarize they found that WPRT still benefits people who get neoadjuvant + concurrent HT, but becomes detrimental in those who get short term adjuvant hormones. They feel that there is an interaction with timing of hormones and that could be a result of hormone related immune modulation. How cool is that! Asbell S, Valicenti R, Hahn S, Thomas CR Jr. Int J Radiat Oncol Biol Phys. 2007 Nov 1;69(3):646-55. Epub 2007 May 24.
followed by adjuvant hormonal therapy (AHT) by > or =10%. have an estimated risk of lymph node involvement of >15%. found in PFS or overall survival between NHT vs. AHT and WPRT compared with PORT. NHT arm compared with the PORT + NHT and WPRT + AHT arms. This is a very interesting topic and I am sure you'll get loads of comments. The standard for high risk is WPRT + hormones. For intermediate risk it depends what situation you are dealing with. Soon you will see intermediate risk further classified in two groups. Patients with low volume Gleason 7 (3+4), PSA <10 can be treated with Prostate RT Alone . It can be either Iodine Seed Brachy alone. Or a Combination of EBRT+ Seeds or EBRT + HDR brachy boost. Where as Gleason 7 with PSA<20 with high volume of involvement will receive treatment more like high risk case. Thanks for the papers guys. Many Thanks Indraneel for the series of papers on RTOG 94-13 —it is interesting how the inferences have evolved over time with increasing followup duration . 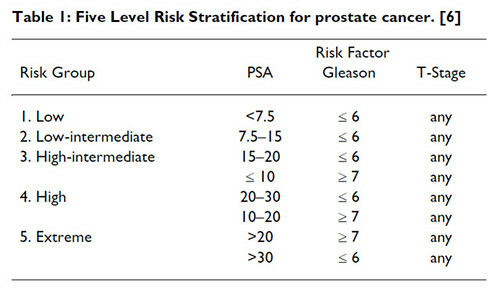 The standard of care for high risk Ca Prostate remains WPRT+NHT till proved otherwise ,as the authors have concluded despite the controversies, while Nikhilesh has interestingly pointed out that soon the management of intermediate risk Ca Prostate will be divided into 2 broad categories based on Risk Stratification . Interesting read . Thanks guys. For all the brachy fans RTOG 0232 is one study to watch for Intermediate Risk Ca. The other multi-centric ongoing clinical trials to watch are PROFIT and RADICALS.